Footprints necklace is a comforting reminder of God's care. 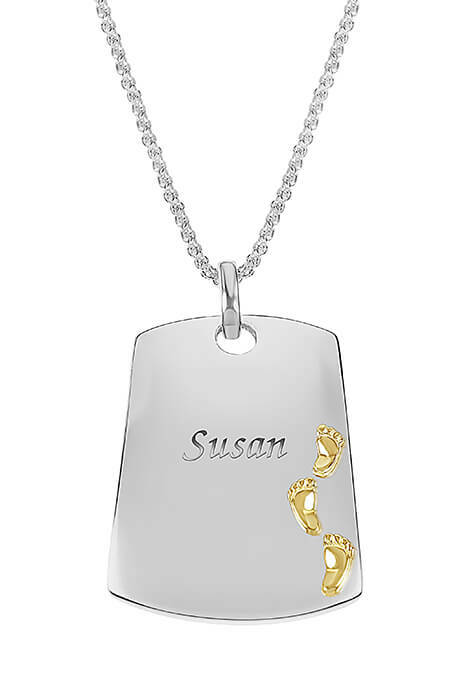 Shimmering silverplated dog tag style pendant features 3 goldtone footprints on the front and can be personalized. The back reads: The Lord replied, "The times when you have only one set of footprints in the sand, it was then that I carried you." 1" wide x 1 1/2" high pendant includes a 23" long rope chain with lobster clasp and 3" extender. Specify name: 1 line, up to 9 letters/spaces. Base metal resists tarnishing. Allow 4–6 weeks for delivery.